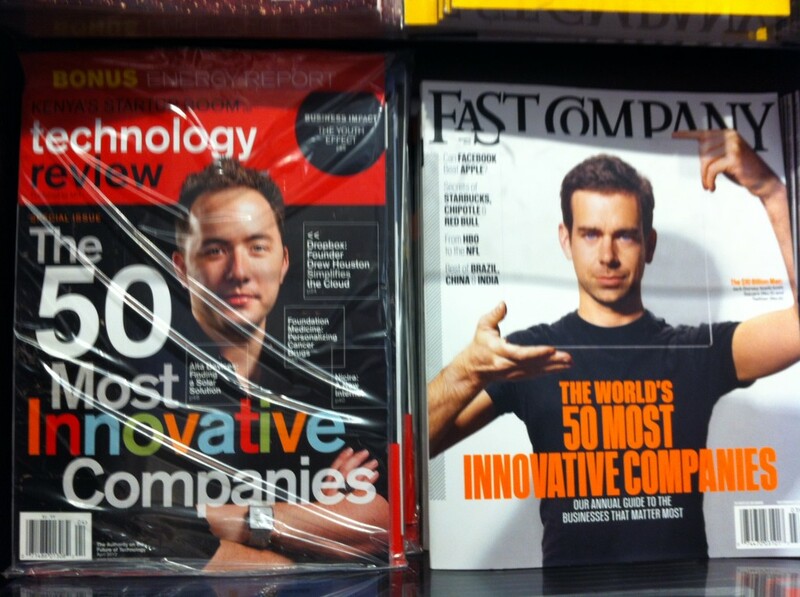 This morning I was browsing in an Airport bookshop and I noticed two business magazines had front page articles entitled the 50 most innovative companies. I didn’t look at either magazine but I can already guess who is included in the list – obviously Google and Apple and Facebook with a few other usual suspects thrown in for good measure plus a few wildcards or unknown rising stars just to make the list not too boringly predictable. For a long time, I’ve disliked the word ‘innovation’ as it is increasingly ubiquitous and therefore has become totally meaningless. And it was only last December that I plucked up the courage to say it in a public forum (at a gathering of innovation professionals) and was surprised how many other people came up to me afterwards and agreed vociferously. Ever since I’ve found it quite liberating and say it as often as possible, and was further spurred on when speaking with the CTO of a major global company last week who made exactly the same point. The reason I don’t like the word is not because I don’t think innovation is important, but rather it means different things to different people/organisations and more importantly it forces people to focus on the wrong thing. Innovation is a process and a culture not an end state. By focusing on innovation as the output of a piece of work you are more than likely to fail. Rather innovation is a by-product of productive and engaged networks as Verna Allee so insightfully puts it. I sometimes jokingly say that innovation is an affliction not a career choice. Nobody grows up wanting a career in innovation but it seems to be the final destination – just before full-blown entrepreneurship – for the insatiably curious, optimistic and possibly unreasonable. It’s a glorious personality defect that should be nurtured, not manufactured. So has “innovation” ‘jumped the shark’? Is it time we need a new word to hang our hats to? If so, what should it be? In any case I’m not sure that would help much, but in the meantime I would like to see a more nuanced and a more human approach to innovation emerge. Else, we will just talk past each other in platitudes and we’ll all be none the wiser. I couldn’t agree more. Innovation has become a proxy word – a halo term. We say innovation when we don’t know what we really mean or when talking at such a general level as to make our statements almost meaningless. I prefer to talk about ambitious creativity. When we innovate (or when we are seen to innovate which is perhaps more important to this discussion since much innovation is never identified as such)what we’re really doing is applying creative thought to ambitious challenges (ambitious either in the sense that the challenge is a newly defined/discovered challenge or is a challenge previously seen as insurmountable). In this sense the ‘newness’ of innovation applies not so much to the solution as it does to the challenge/value aspect. It could be said that ‘innovation’ creates value by discovering challenges more so than inventing solutions. Good spot Roland. It is the same for the word design, but then it is the beauty of the words that they can be used in lots of different contexts, as soon as you start to examine them too much you could be accused of navel gazing! of course in isolation they are general, context is key as demonstrated when you both explain the word above. We also suffer from this in the Sustainability sector. The term ‘sustainable’ or ‘sustainability’ is used to give a halo effect to any business or product efficiency implemented. Sustainable business practices, similarly to innovation, seek to solve problems between relationships, taking account of the environment we live in. It was CSR, 10 years ago, and in another 10 years it will be something else. I agree with Nick, we need to keep our eye on the ball and focus on impact not semantics, while being clear about what we’re up to. Not easy, as I’ve just discovered drafting this. As an innovator, you are psychologically conditioned to become bored of innovation. By definition if you can say hand on heart “I am an innovator”, you are not! By implication as a true “innovator” your search for things to innovate will eventually run out of juice. You must eventually turn inward into the mind-warping quest and ‘go quantum’ on innovation – to rip off the surface form and unearth the intrinsic ‘quality’ of innovation itself – its intrinsic innovativeness. Depressed, you will eventually realise that the deepest change only reveals the underlying sameness of things. Innovation is simplification. A new plan occurs. You decide to reach outward into systems thinking, devising ground-breaking theories of meta-innovation and on into meta-meta innovation which define the entire superstructure of social network interaction…to eventually conclude after years of painstaking research that… ‘people like people that like them’. We are all in thrall to the cult of the new as a pleasant diversion from the reality that life is getting distinctly worse in quality of life terms for the vast majority of the Western world. In denial of despair and tediously post-self-actualised, we are pre-programmed to see novelty where there is none. We willingly cast aside common sense, personal experience and historical perspective to marvel at the constant refurbishment of reality and declare it as ‘innovation’. Roland, I share your views on the mis-use of the word “innovation” but you should actually read the MIT TR article before condemning it – you can get a 14-day trial subscription on Kindle if you want (as I did when a colleague recommended it recently). Alice – yes sustainability is another one of these words. Perhaps we need to create a dictionary of difficult to define and important through sometimes meaningless words. Mark – Thanks and guilty as charged. I didn’t even look at it and will endeavour to do so. Roland – like an anti- placebo. Yes! Innovation is a meta process and can only be constructed backwards. In the words of the first issue of Arcfinity. “The future always wins”. Roland – thanks for the blog and for all those who commented. In working with organisations in this area I’ve tried to instill the concept that innovation is a way of life. You can’t just do it, it takes time, space and a culture to develop it. By it’s nature it re-invents itself and it less a linear process, than a cyclical journey. Innovation in that sense never ends. Sadly, we’re always presented with the case studies of the big boys. In most cases, they’ve taken years to develop their culture – but are presented as a process.